Learn proper swim technique, developed cycling skills and run faster and more efficient. All aspects of triathlon training are covered including nutrition instruction. Beginners welcome. On-line and in-person triathlon coaching is available. 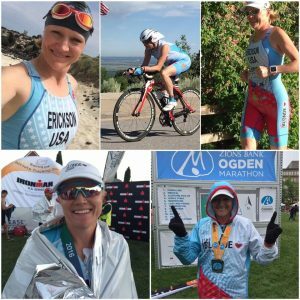 “I have enjoyed working with you on my triathlon goals and races. I am highly satisfied with your coaching, I appreciate your efforts in my training and I want to continue to succeed with your help. Last year, you helped me break ALL of my PRs in running and this year (so far) you have helped me SET 3 new PRs (Full Marathon, Half Century and Duathlon)” – Angela M.